- Progress and Status Reports for organizers/moderators - Franchises available! The PresenterTM represents the absolute peak of conference presentation technology. 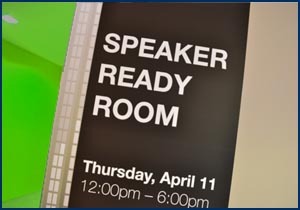 Based on our own proven methods of speaker ready room procedures, The Presenter is the first software application of its kind -bringing a whole new world of possibilities to association and conference organizers. 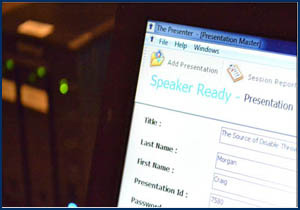 The Presenter includes a self-loading Kiosk for submitters in the speaker ready room, a Manager configuration to oversee and maintain control of all talks conference-wide, and, a Show module for automatic sequencing and projection of presentations in the session rooms. 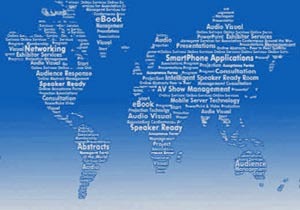 One World Presentation Management perfected this meeting design based on our experiences performing Presentation Management in almost every major city in the United States and Canada, as well as, in 25 other countries around the world. 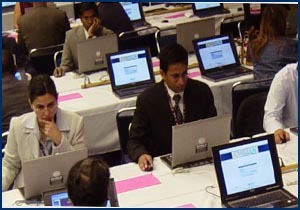 We've gained unparalleled experience with crucial issues such as the many different versions of PowerPoint and video clips, international customs, and countless venue variations. Presenters need a bullet-proof system that works with their busy schedules, and one that will help to avoid distractions from complicated screens or procedures.